A lot of people have been writing in lately about their particular situation and the best way to get rid of mice. It’s all too common to hear that they’ve followed this site’s advice about setting traps and mouse proofing their home, but to be faced with a continuing mouse problem. It’s not that they’re doing something wrong, it’s just that they’re doing it in a sub-optimal fashion. Often times the problem stems from the way they bait the trap, or simply from the trap that they’re using. If I had a dollar for every time I hear that the mouse keeps stealing the bait, I’d be a rich. If anyone wants to take me up on that offer, drop me a line in the comment section below. I’d gladly take a dollar from you. :) The most popular type of mouse trap is the snap trap and with good reason. It is relatively inexpensive and it’s very effective. The problem is that people will buy the cheapest one, and suffer from the triggering mechanism. Sometimes it’s too stiff, and other times it’s too sensitive. To combat that, simply stated, you need to buy a better mouse trap. That’s what this article is about. I’m telling you about this trap not based on my personal experience, but based on the experiences of hundreds of other people who had mice problems. In my opinion, it doesn’t matter if something works once … even a blind squirrel finds a nut every now and then. What matters to me is that the effectiveness of the trap is the rule, and not the exception. If people are consistently reporting good results with the trap, then in my opinion, that makes it the best mouse trap out there. 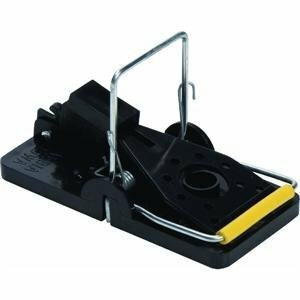 The trap I’m talking about is one that I’ve mentioned multiple times on this site already, the Snap-E Mouse Trap. Frequently when people think of a snap trap, they think of the wooden paddles, and why not? That’s what people have been using for the last 50 years (probably longer). While this shouldn’t come as a surprise to you, especially in the day and age of computers, but technology advances. Mouse trapping technology is no exception. If I was to compare the snap-e trap to the wooden paddle trap, I’d liken it to that of the typewriter versus the computer. The typewriter was a tried and true method for typing a letter, but the computer is so much more. First off it’s constructed of polystyrene and steel, no more flimsy wood paddles. The problem with wood is that it absorbs the smell and fluids from the dead mice, and clean up is virtually impossible. They are practically disposable. This trap is extremely durable and easy to clean. That means it’s going to last for more than one kill. It’s slightly more expensive than that wood paddle traps, but it’s not going to be tossed in the trash after one use. It can easily be redeployed time and time again. It is simple, safe, and most importantly sanitary due to the material’s natural resistance to stain and odors. The other problem this trap addresses is the baiting conundrum. For some reason people have trouble baiting the trap … either too little or too much. Or sometimes it’s just not positioned in the optimal place on the paddle. The Snap-E trap addresses that by building a bait cup in the optimal position. This helps in multiple ways. There’s no worries about bait placement. You put it in the cup and you can guarantee that it is optimally positioned to maximize the kill rate. The bait cup will drastically reduce the chance of stolen bait. It definitely has a leg up on the smart mouse. The other thing this accomplishes is that the cup is indented. You scrape a little peanut butter inside the cup, and it’s not sitting on top of the paddle. The mouse has to physically reach INTO the cup to pull it out. The key is to not fill the cup completely, but line the inside of the cup so that no peanut butter is sticking out. The mice don’t have to see it (they have terrible eye sight anyways), they just need to smell it. That’s the key. Now I’m not going to say that this is one hundred percent effective, but I’m certain that it will be better than the results most people are getting. to kill with its vertical strike bar. One of the better design decisions with this trap is what is called a vertical strike bar. The strike bar is what you pull back on the trap, and when triggered strikes the mouse dead. I call it vertical because in the set position, the strike bar is vertical. On a typical mouse trap it is pulled all the way back. What this means is that the distance the strike bar has to travel to kill the mouse is halved. It’s no longer winging all the way from back to front. It’s just above the mouse waiting to come down on top of it with a deadly blow. With a reduced reaction time the success rate of this trap is improved. 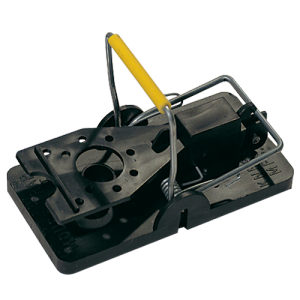 The trigger paddle is sized larger than the typical mouse trap. What this does is increase the effectiveness of the trap from different approach angles. Did you know that the angle at which the mouse approaches the trap makes a difference? With some traps, approaching from the side or the rear reduces their effectiveness. The oversized trip paddle on this trap is designed to minimize the possibility of a missed opportunity due to a suboptimal approach angle. I know it sounds like this sounds awfully complicated for doing something as simple as catching a mouse, but it makes you appreciate the engineering thought put into this design. There was a lot of thought put into the design of this trap. Combine that with the reported success by hundreds of satisfied customers, and that makes this the best mouse trap on the market. If you’re interested in where you can find this trap, Amazon has it available through prime as a 1-pack or a 6-pack. If you do go out and buy this trap, I’d be interested in hearing your results. If a better mouse trap hits the market, I want to be sure to update this page to reflect that. I’ll leave you with one last thought … if you just realized that you have a mouse problem, you should know that statistics have demonstrated that more mice are trapped on the first night than any other night. That being said, it is critically important to deploy a large number of traps on the first night to try to catch as many as possible. After the first few nights, it’s not uncommon for the number of catches to drop to zero. As a devastating as that sounds, the importance of deploying multiple traps on day zero is critically important.